VHDL is an abbreviation that contains another abbreviation inside it. VHDL stands for VHSIC Hardware Description Language, with VHSIC standing for Very High Speed Integrated Circuit. (which gates a clock signal) is equivalent to the circuit layout shown in Figure 1. Technically speaking, the compiler is said to ‘infer’ circuit elements by looking at the way HDL statements have been written. Thus, a simple assignment statement such as z <= a + b; is enough for a VHDL compiler to infer the need for an adder circuit. This way, a designer can focus on the task at hand rather than how to implement it in hardware. Some of these statements are sequential; that is, they signify operations that are performed one after the other. Other statements are concurrent in nature, i.e., in the hardware, they execute together at the same time. Concurrent statements are a hallmark of HDLs; software programming languages only have sequential statements. Any number of in and out signals can be included in the port part. The mode can also be ‘inout,’ which stands for a bidirectional signal. Here, the signals are std_logic which essentially means they can represent a single bit such as 0 or 1 (or even a high impedance state: Z). Multi-bit vectors that represent bytes and words will be of a type such as std_logic_vector (7 down to 0). Once that is done, the FPGA assumes the personality ascribed to it through the user’s configuration code. From that point on — unless its configuration is altered — it is essentially a function-specific digital IC that you designed yourself. What are FPGAs used for in preference to microcontrollers? There are several answers to this question. 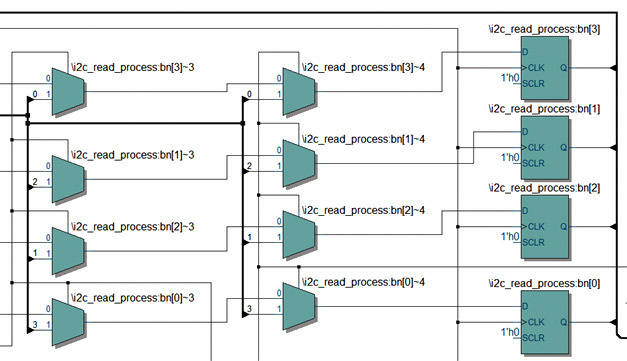 Logic consolidation (where one replaces a number of digital ICs with a single IC) is a big reason for using FPGAs. Due to the large number of logic elements (LEs) and I/O pin resources in an FPGA, a number of functions can be placed inside the same FPGA. For example, an ADC controller, a number processor, and a display driver (among other functions) can be placed inside an FPGA. Many commercial products use FPGAs in this way to make products smaller, lighter, and cheaper. Transmission protocol conversion (USB-to-serial, serial-to-Ethernet, I2C-to-SPI, etc.) and logic level translations are other commonly encountered functions that are frequently performed with FPGAs. The fast and deterministic (known timing delays) nature of FPGA circuits makes them especially suitable for these duties. Due to the high speed with which FPGA implementations can work, FPGAs are often used to remove the processing load from processors. Specialized processing such as fast Fourier transforms (FFTs), floating-point operations, digital filtering, etc., can be efficiently carried out in FPGAs, leaving the main processor in a system to execute the main thread of program flow, respond to interrupts, etc. Stored program processors are eminently suitable for carrying out a set series of instructions repeatedly. FPGAs can off-load them from carrying out complicated algorithms that will take a very large number of program instructions to execute. The combination of a traditional processor and a programmable logic device can be very powerful and is one that is often seen in many types of defense, avionic, industrial, and medical equipment. Another scenario where FPGAs are usually employed is seen when a certain operation has to be performed in parallel on a large number of different data bytes or words. This often happens in video processing and scientific vector calculations. Yet another situation where FPGAs have a definite edge over processors running software is where large arrays have to be scanned quickly. Cameras and displays can both use FPGAs with their large number of I/O pins to quickly scan arrays and columns in order to acquire or display images. Today, FPGAs are mainly manufactured by a handful of semiconductor companies. Xilinx, Altera, Lattice Semiconductor, Microsemi Corporation, and Cypress Semiconductor form the list of main US FPGA suppliers (in order of market share). Over a year ago, Altera was acquired by Intel Corporation, so that it is now a part of Intel’s business. This large acquisition underscored the importance of programmable logic in today’s electronics. Each company has its own line of FPGA offerings which range from relatively small (and cheap) ICs to very large devices with millions of LEs and hundreds of I/O pins. Not surprisingly, FPGA prices vary widely from just a few dollars each for small devices, to hundreds and even thousands of dollars for top-of-the-line chips. A visit to the websites of FPGA manufacturers is highly recommended as that is where they showcase their new as well as established products, and describe their features and capabilities in detail. Smaller FPGAs, such as those in the Spartan family from Xilinx and the Cyclone family from Altera (Intel) are very suitable for use by hobbyists. Many easy-to-use development boards are available that contain an FPGA together with other useful devices, such as memories, ADCs (not all FPGAs contain analog-to-digital converters), clock oscillators, etc., in addition to a few switches, LEDs, and seven-segment displays. These development boards range in price from less than a hundred dollars to thousands of dollars. 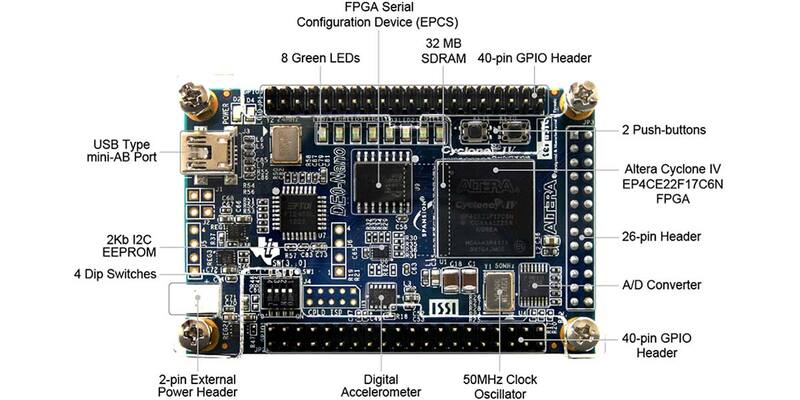 As an example, Terasic (a Taiwanese company) makes a large number of FPGA boards using Altera (Intel) FPGAs. 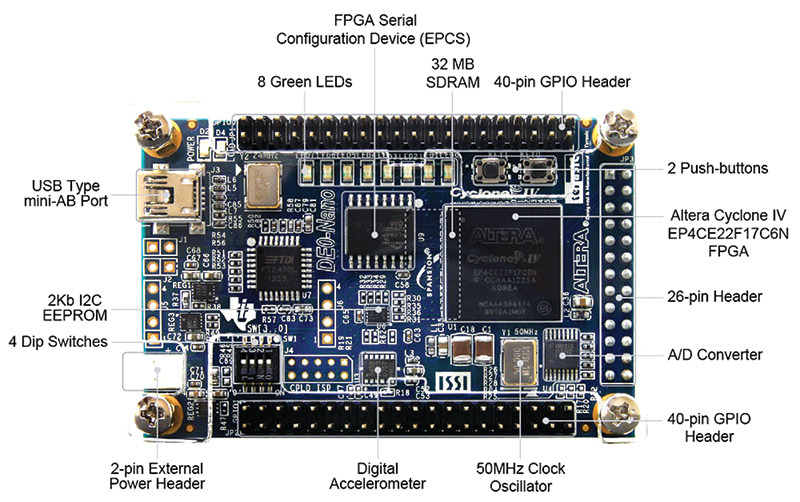 Some — such as the DE0Nano board pictured in Figure 3 — are cheap (~$70) and very easy to use for anyone who wants to learn more about FPGAs. These boards come with detailed documentation on how to use them and exploit their many capabilities. Along with development boards, one also needs software for writing and compiling HDL code. 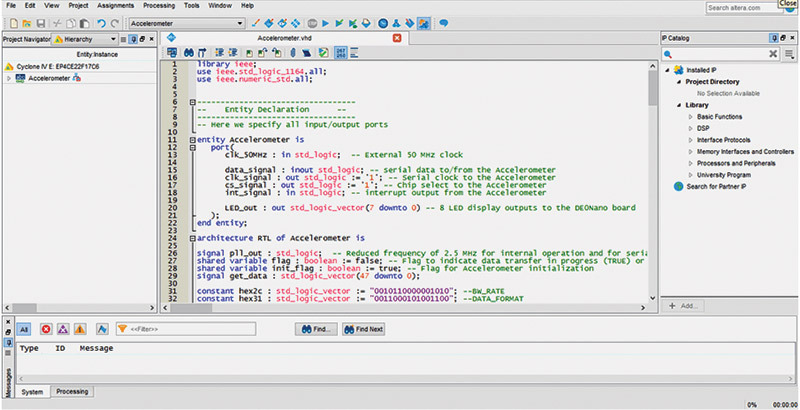 HDL compilers can be easily downloaded for free from the websites of all FPGA manufacturers. Xilinx offers its ISE and Vivado development suites, while Altera (Intel) makes its Quartus Prime software available (Figure 4) free of charge to all FPGA application developers. These development programs can be used for compiling either VHDL or Verilog code. For a novice, it is best to get hold of any good FPGA development board and begin by writing simple Verilog or VHDL code, compiling it, and downloading it to the FPGA. In most cases, the compiler will flag syntax errors and even logic errors — if any — which is a useful way of learning an HDL. Some companies (like Digilent) make small pinned FPGA modules that can be more easily embedded into larger projects as they do not contain extra hardware that full-blown development boards contain. How about including an FPGA chip on your own printed circuit board (PCB)? This can certainly be done, but is somewhat challenging and thus not recommended for beginners. A very large number of helpful learner-focussed videos are available on YouTube. As for books, many are available covering FPGAs, VHDL, Verilog, and complete digital system design with programmable logic as a search online will reveal.